Enjoy some inside stories into my world beyond the clouds and enjoy some carefully put together short stories and pictures. To me, flying is more than just a job I try to put together the magic we experience up there every day. Do you want to have your own part of my skies home or are you looking for a gift for someone special. 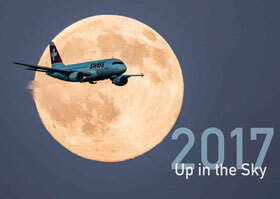 Check out my store and get your copy of my 2017 photo calender taking you to the skies every month. Flying the friendly skies since six years makes me not only enjoy breathtaking views but als experience a world beyond the clouds. As an Airline Pilot based in Switzerland I get to travel and explore the world for a living. As 2019 is approaching fast it's time for a new photo calendar. 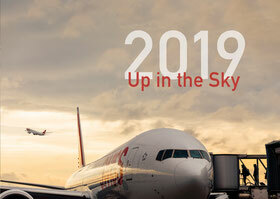 In my 2019 edition of "Up in the Sky" I show you again some insights into my daily life beyond the clouds. 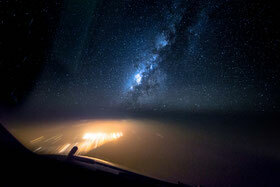 Enjoy breathtaking view from the flight deck on my journeys across the globe. Join me to do some stargazing at the Milky Way, enjoy a sunrise over the Artic or see the impressive visual effects of a passing thunderstrom close to the Airport. My 2019 photo calendar is available to order since a few days. Check out my Behind the Scenes story and take a closer look at the featured pictures and their story behind in this short article. It shows all 14 sheets of the calendar as well as all the text of the backpage. By ordering your copy you help to support the SWISS Kinderstiftung, a charity organisation taking care of children in need. Thank you! In the midst of central Switzerland, a passionate adventurer takes on a sled ride with his beloved dogs, the huskies. From the warm hut to the frenzied animals, they take on a sled ride through woods and snow. Yet another scarce passion pursued by many individuals worldwide. Its been a pleasure working together with Federica and Elias from birvekennel.ch and to see their passion for dog sledging. Head over to ther website if you wish to try this unique outdoor experience yourself. A short movie I produced together with my team over at SkyProduction.ch on a beautiful winters day. Every year young aspiring aviators get their first chance to get hands-on training and feedback for their future career above the clouds. This government-funded training program is called SPHAIR and the graduates of this year got invited for a special event that involved not only a scenic flight above the Alps and meeting our former astronaut Claude Nicollier. Enjoy this short movie I did together with my team at SkyProduction.ch on a beautiful day in September. My 2018 photo calendar is available to order since a few days. Check out my Behind the Scenes story and take a closer look at the featured pictures and their story behind in this short article. It shows all 14 sheets of the calendar as well as all the text of the backpage. By ordering your copy you help to support the SWISS Kinderstiftung, a charity organisation taking care of children in need. Thank you! As 2018 is approaching fast it's time for a new photo calendar. 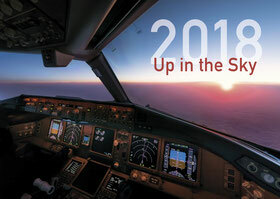 In my 2018 edition of "Up in the Sky" I show you again some insights into my daily life beyond the clouds. 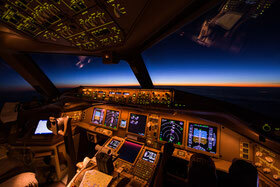 Enjoy breathtaking view from the flight deck on my journeys across the globe. Join me to do some stargazing at FL360, enjoy a sunset over the Atlantic Ocean or see the impressive visual effects of the St. Elmo's fire while crossing the Intertropical Convergence Zone. 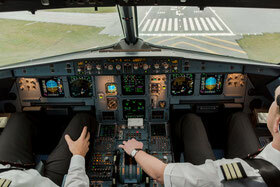 Of course we will let you arrive in style and the good news for all Avgeeks out there is, yes its on the flightdeck. Enjoy this visual ride through Zurich. A few days ago the last Avro RJ100 aka Jumbolino left our fleet. 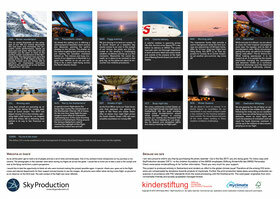 Together with my team over at SkyProduction.ch we got to create the latest video for SWISS Intl. Air Lines. Come along and take a peek into the hangar at night where the Avro meets his sucessor the Bombardier C Series and see what happens. I am wishing you all the best for 2017 and many happy landings. The last year has been a great one and I am looking forward to share great moments from above the clouds with you in the new year. 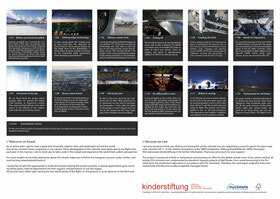 I am glad to announce that my photo calender "Up in the Sky 2017" has been a stricking success and is completely sold our. Thanks to you and your kind support I will be able to support the "Kinderstiftung des SWISS Personals" with some great CHF1710.- The raised money will support children in need and help them to have a home or education. My 2017 photo calendar is available to order since a few days. Check out my Behind the Scenes story and take a closer look at the featured pictures and their story behind in this short article. It shows all 14 sheets of the calendar as well as all the text of the backpage. By ordering your copy you help to support the SWISS Kinderstiftung, a charity organisation taking care of children in need. Thank you! As 2017 is approaching fast it's time for a new photo calendar. In my 2017 edition of "Up in the Sky" I show you again some insights into my daily life beyond the clouds. 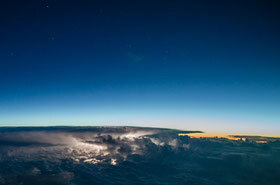 Enjoy breathtaking view from the flight deck on my journeys across the globe. Join me to do some stargazing at FL360, enjoy a sunset over the Atlantic Ocean or see the impressive visual effects of the St. Elmo's fire while crossing the Intertropical Convergence Zone. Not quite night, not yet night - The hours in between are almost endless when flying east-west. On two thirds of the flight, I occupy the right-hand seat up front, thundering through the dark skies in the middle of nowhere. Just another night up in the sky one could say as we are approaching the West African coastline over the Senegalese capital of Dakar. My shift in the cockpit is slowly coming to an end. Our mere 11hrs and 20 minutes’ flight is just about to enter its final third as we are reaching Europe over the west coast of the Caspian Sea.